←Arriving in Mazatlan :: A New World! One of the most exciting things we’ve had the opportunity to witness recently is citizen activism in Mexico. On July 1st, Mexicans came out in record numbers to vote in the presidential election – it was the largest voter turnout in their history! Soon after, thousands of people took to the streets throughout Mexico and the world, protesting the election results as fraudulent. I randomly came upon protesters gathering in the streets in Mazatlan on July 7th. Luckily I had my camera and, since I was on my bicycle, was able to zip in between traffic and down side streets to get some great footage of the “MegaMarcha” (see video below). Voters thumbs are marked with acid to prevent voter fraud. To fill you in on the history, if you don’t know it already, for weeks building up to the election, a non-violent student-led movement against widespread and blatant electoral fraud had been challenging the status quo, the election process and the candidates ties to media bias and big business. The group, named #YoSoy132 (I am 132), formed fiercely and quickly in reaction to an event in which Peña Nieto attended. 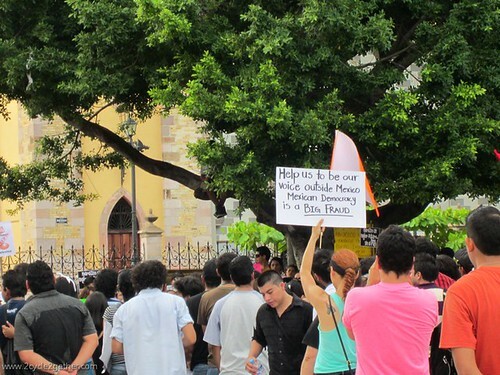 Carefully selecting a Catholic university to make a scripted pre-electoral appearance, he and his team were surprised to be met with student protesters, who were unhappy about his party’s (PRI) previous corrupt and oppressive tactics. When questioned and approached by the students, it’s reported that Nieto was swept away and hid in the bathroom until he could escape. Televisa (the media monopoly in Mexico alleged to be biased toward the PRI party) and Nieto responded by reporting the protesters were not students but were AMLO (the opposing party) people brought in to disrupt the process. Furious over the attempted cover-up of their protests, students, in response, made a YouTube video to counter the media’s inaccurate reporting. In the video, each student that was at the protest held their student I.D. up to their face and said “Yo soy numero xxxx” (“I am number xxxx), reading off their student number to prove they were students. 131 students came forward for the video. As a result of their public outcry, thousands of youth, community activists and ordinary citizens stepped forward to join and support the students with the slogan, “Yo Soy 132” or “I am #132”. A citizen movement was born. In the weeks and days leading up to the elections, students and citizens began recording scenes of voter fraud and reporting incidents to the election fraud tribunal. They sat in front of electoral stations throughout election day to witness the process and report fraudulent activity. 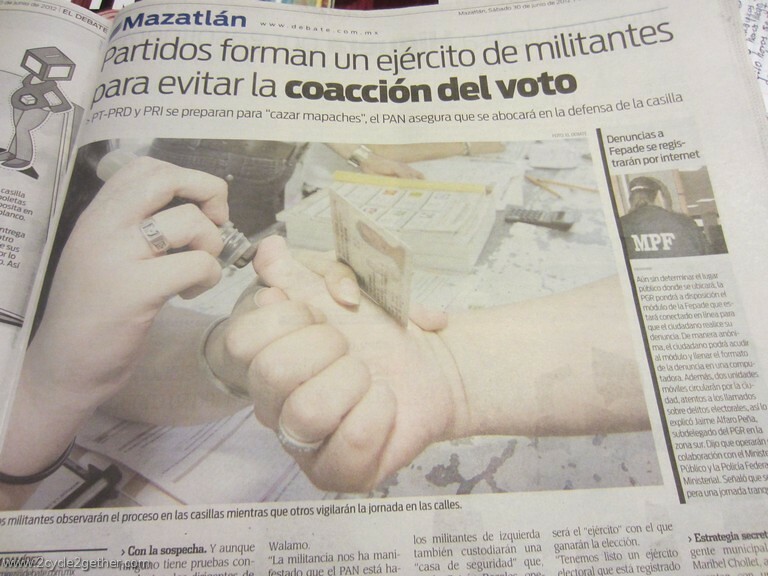 Video footage and witnesses reported PRI offering gift cards, 500 pesos and Tupperware, among other items, in exchange for people’s votes. When election results started rolling in and indicated that Nieto had won the election, protesters took to the streets, claiming that the election was a fraud and that the PRI party had illegally bought the election. Protest Against Election Fraud in Mazatlan, Mexico :: July 7, 2012 from 2cycle 2gether on Vimeo. Since the protest I witnessed on July 7th, additional “Megamarcha” or “MegaMarches” have taken place throughout Mexico. Protesters, just a few days ago, held a blockade and 24-hour siege against media giant Televisa. At last count, leftist candidate Lopez Obrador got 31.59% of the votes while PRI candidate Nieto received 38.21%. There are plans to file a formal legal challenge against the validity of the vote, with AMLO claiming that PRI tilted the results by illegally buying millions of votes. In the past, the Federal Electoral Tribunal, who must certify a final vote by September, has declined to overturn previously contested elections.